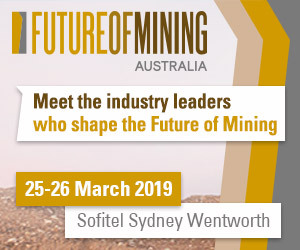 The Future of Mining Australia Conference takes place from 23-24 March 2020 in Sydney, Australia and is an opportunity for the industry to come together to discuss and debate current market developments, industry challenges and future trends that are changing mining's future. Curated by our AMM Editorial Team and our Esteemed Advisory Board, the Future of Mining Agenda address' the key operational, strategic and technical developments both regionally and globally. Focussing on our six key pillars (Exploration & Development, Sustainability & Optimisation, Innovation & Technology, Strategy & Planning, Connectivity & Digitisation and People & Leadership) the programme has been designed to step away from the traditional transactional conference model to provide a thought-provoking and practical experience. This is an event created by industry, for industry, and delivers a content programme that goes beyond the new and up and coming technology to push boundaries, encourage out-of-the-box thinking and aid industry professionals in solving problems and creating new opportunities. Next year's event will see even more companies come together to display and discuss their current and up-and-coming projects which will drive the mining service arena to new heights. The exhibition floor will put on a display of leading mining companies, service providers and start ups giving our 500+ attendees the chance to interact with a diverse array of technologies and innovations from around the world. Our interactive group Knowledge Exchanges will bring together a small dedicated group of attendees to discuss and debate some of mining's most crucial and game changing opportunities for the coming year. In 2019 these were led by Platinum Partners, Caterpillar, Inmarsat, MMD and Komatsu, and will offer the exclusive opportunity to deep dive into set topics with experts in the field. Knowledge Exchanges are a great way to share knowledge, experiences and ideas through an informal roundtable. The Future of Mining Awards ceremony will be taking place on the evening of 23rd March as the industry celebrates the winners at a special reception in categories including Operational Excellence, Innovation, Environmental Excellence, Emerging Leader of the year and Startup of the year. Further details about the nomination process will be released soon. Find out more. No other conference is backed by the knowledge capital of the experienced Australia's Mining Monthly and Mining Magazine editorial teams, which enables us to offer genuine insight into the catalysts and the trends redefining the global mining environment. Aspermont Media is the preeminent publishing house for the gloabl mining sector, with publications including Australia's Mining Monthly( AMM), Mining Journal (MJ), Mining Magazine (MM) and MiningNews.Net (MNN), giving us unparalleled reach and knowledge into the industry. We are now combining our brand intelligence and unrivalled audience to bring the market a new way of exploring the future of the industry, from core production through to future technology and innovation impacts. Our attendees will hear from inspiring keynotes and in-depth case studies meanwhile having full access to our strucutred networking and interactive group discussions in an immersive two day event designed to meet every business need. Aspermont has been driving the Future of Mining debate digitally since the launch of the Future of Mining digital content hub in 2016. Our Future of Mining event continues this important debate in a new forum. We will address jurisdictional and governance changes as well as cruicial operational and technical developments through our independently created agenda that has been designed with our esteemed industry Advisory Board.